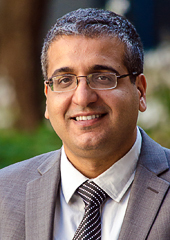 Omar Farahat’s areas of interest include legal theory, comparative law, theoretical and theological ethics, and religious forms of regulation relative to modern legal systems. His current research focuses on Islamic legal and moral theories, centered on the analysis of key concepts in Islamic legal theory in conversation with similar debates in contemporary jurisprudence. His newly published book, The Foundation of Norms in Islamic Jurisprudence and Theology (CUP, 2019) explores the role of divine commands as a normative source in Islamic theology and legal theory. His work on Islamic legal theory and ethics has appeared in the Journal of Law and Religion and the Journal of Religious Ethics. He has presented his research for the Middle East Studies Association, the British Association for Islamic Studies, the Society for the Study of Muslim Ethics, among other venues. He has research forthcoming in The Routledge Handbook of Islamic Law and in Oriens. Omar Farahat completed his Ph.D. at Columbia University in 2016, after which he worked as a Research Fellow at Yale Law School. Prior to that, he obtained a dual law degree from Université Paris 1 Panthéon-Sorbonne and Cairo University in 2004, an LL.M. from Harvard Law School in 2007, and an interdisciplinary M.A. in the humanities from New York University in 2010. He has practiced law in Cairo, New York, and Paris. Law and religion, theistic law and ethics, Islamic law, comparative law, legal theory, ethics. Professor Farahat is always interested in supervising graduate work in these areas. "...a new way of understanding the work of classical Islamic theologians and legal theorists who maintained that divine revelation is necessary for the knowledge of the norms and values of human actions. Through a reconstruction of classical Ashʿarī-Muʿtazilī debates on the nature and implications of divine speech, Farahat argues that the Ashʿarī attachment to revelation was not a purely traditionalist position. Rather, it was a rational philosophical commitment emerging from debates in epistemology and theology..."